LONDON: Alastair Cook marked his final Test innings with a storybook hundred as England piled on the runs against India at the Oval on Monday. Together the pair had so far shared an unbroken stand of 181 for the third wicket, with England — who had already won this five-match series at 3-1 up — a commanding 283 runs ahead. 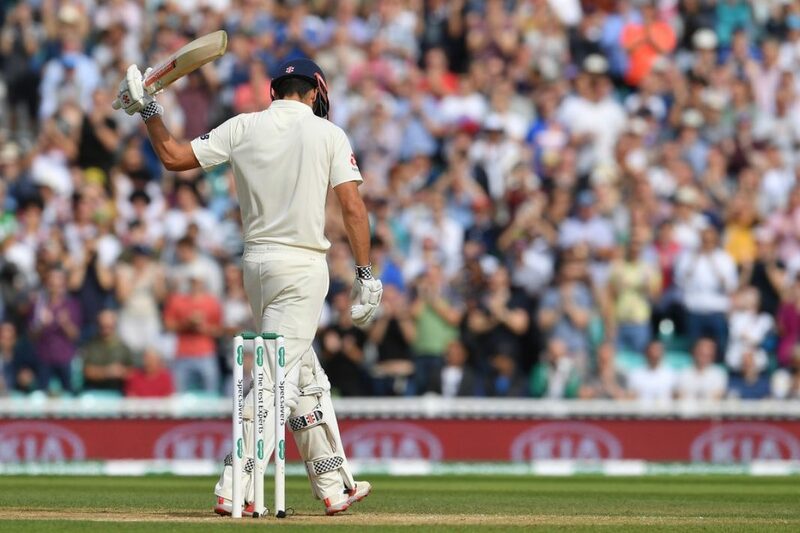 Cook is retiring from international cricket after this match and Monday’s innings meant he became just the fifth player and first Englishman to score a hundred in both their first and last Tests after Australia’s Reggie Duff, Bill Ponsford and Greg Chappell and India’s Mohammad Azharuddin. Cook and Root extended England’s lead to beyond 200 runs before bringing up a century stand of their own. When Cook squirted a leg-side single off Shami he moved past Sri Lanka great Kumar Sangakkara’s tally of 12,400 Test runs and into fifth place in the list of all-time leading Test run-scorers. The 33-year-old Cook, about to become a father for the third time, was already England’s leading Test run sccorer and century maker, with this match seeing him extend his national appearance record to 161 Tests.